Las Vegas insider Shanny Deridan has posted the following odds on the ICE Series contest at Red Lake February 21 near Washkish Minnesota. After 2 days of prefishing I would have thought that my name would have been somewhere on the odds board. Guess they must have had a little Gremlin sitting on my shoulder. Lots of Wallys, but only a few Crappies. Brett Favre and I just got back from a 5 dayer up there! Well, Winni too. Now I got 2 other cheddar heads begging me too take them tommorrow for a 3-5 day trip. I think I'll just move to Waskish for the next month or so! I'll probably still be there "pre-fishing" by the time the "Ice Series" rolls around! Put your bait money on the Cyberfish. 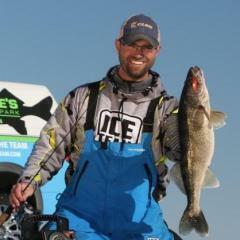 He's the man on winter crappies. Only Fishface could give him a run for his money. Word from Vegas insider Team Cheddar out to take the title back to "Title Town". News flash from Green Bay Wisconsin: A team of highly skilled anglers is right now located on a giant school of Red Lake crappies. These anglers are using their instincts to stay on the fish. Cheddarheads are right now at this moment replaying the 1966 Superbowl DVD in their fish houses just to get that winning feeling and the proper vibe for victory. well boys I think I'm comming down to red on sat..gotta have a few canadians in this derby..does this change the odds..lol.. I think that winning feeling stems from the month old cheese curds I found in the back of my refrigerator. Believe me, the team of so called "highly skilled experts" are nothing more than a couple of beer swilling, cheese eating, hook stuck in the finger, handicaps. One of them broke the globe on my lantern....TWICE!! Nahhh, I think I'll wait a couple days then talk my girlfriend Julie into going, maybe take a couple vacation days off work....She's much better company ....And she'll out fish them boys anyday!!! Shanny Deridan updated odds- Upon seeing Ryan Johnson with a giant crappie Ryan now listed at a good price of 15-1. Shanny not aware of Canadian expertise on panfish. Shanny also now lists famous Canadian 3rd baseman Corey Koskie at 30-1. New Red Lake Favorite announced: Julie Canitbeluck. Since Shanny knows women are the anglers to beat Shanny has placed Julie at 5-2. Shanny explains, If past performance is a predictor Julie will fish in a good spot picked by the pro's and she'll use her own special lure and superior angling skill to catch the largest crappie in the system. Lady anglers not afriad to ask for directions to spot making Canitbeluck a greater threat too he's now listed at 9-2. Place your wagers now. Seabass is going to make a run for the title too, he always seems to catch those slabs! just gotta make it across the bordernow..anyone know where the tunnel to the underground railroad starts?? I think Leboux can help with that. Colonel Klink has Sgt Schultz on night watch. A couple of pieces of strudel to Sgt. Schultz and....."I see nothing!, I hear nothing!" WGMSA, How can Julie refuse now? Thanks! I needed a little help trying to convince her to chase her "destiny". Then I wont have to ride with my 2 friends (Team cheese dip) in the gas guzzling Sherman tank(motor home). I can just hook up with them there to use there facilities....and not pay another $300 in gas like we did last week! Oh the wheels are turning now! Lets see, perhaps some more "clearance sale" Valentine flowers are in order. Picked up a dozen roses and a vase for $6 yesterday! PS: Hey Matt, I think we're related......Can you send me some GPS coordinates? Please? Seriously, can you help a brother out? Camp Jigglestick....need not say no more! The Spook is ready. Odds should be much less by Saturday morning. Probably even money. can it be luck?...well...can it? Spook, are you planning on catching these fish yourself or is that why you are bringing Z with? Either way, you better hope that he doesn’t out-fish you as badly as he did on LOW! I would never hear the end of it if he walked away with the title! At present I am not planning on fishing this one, unless of coarse the weather is perfect and Cyberfish convinces me to Go. 9/2 odds. Not bad considering I havent touched Red yet this year. Its Frozenminnows job to put us on fish. I may have something up my sleeve though. Poutslayer should be in at about 40/1. Oh wait this is Crappie fishing isnt it? Forget it Poutslayer will only catch Northern and Pout and play with Perch all day! Poutslayer leave your scissors at home for this one!! Its gonna be a good weekend for sure! Northlander I figure that we would set up perimeter all the way around MJ5 and catch the ones that Mr. Crappie misses due to having to re-bait. Sounds like we may have some really nice weather. Thems those bottom feeding walleyes on LOW. These is crappies. It's a whole new ball game. I couldn’t resist poking a little fun at you guys, that many fish coming out of one shack just isn’t fair. I'm sure that if wgmsa knew how the Fish-Gods were smiling down on you guys, your odds would have been much higher! If the same sort of success repeats itself on URL, you’re looking at a clean sweep at this event. I understand that you have put together quite a trip! I will be making some venison jerky to bring along. Talking 20 to 30 degrees Friday threw Sunday. Best thing is the weather will have been steady for almost a week so the fish should be on the move. This could be a very exciting trip. Lots of things seem to be falling in place for us Frozenminnow! Shanny's inside info has Matt Brueur and Brian Jones on fish and looking good. Their hooksetting has been sound and they both sport fresh line and sharp hooks. Julie is still the angler to beat. Women are undefeated in ICE events enough said from Shanny. Dennis Steele is a solid longshot chance at 10-1. Dennis has been seen working overtime on his game...good play for the money.